I had the please of interviewing Dr. Angeline Beltsos, MD. Reproductive Endocrinology and Infertility (REI). 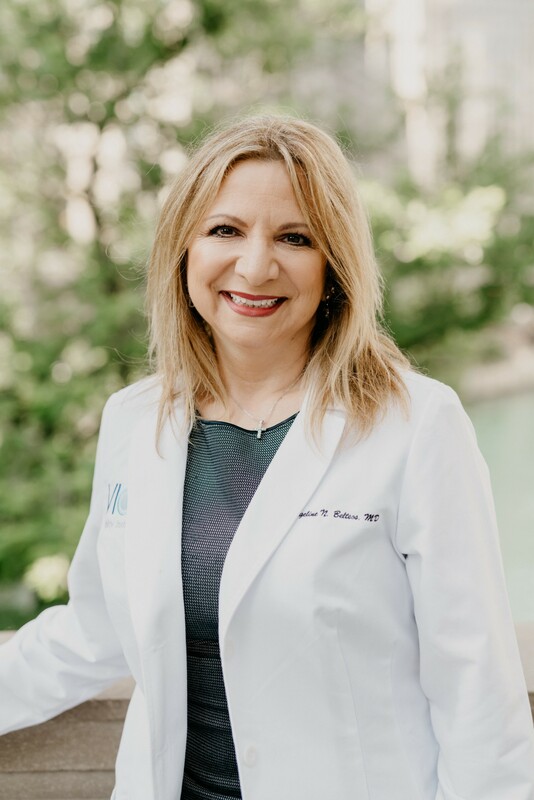 She is the medical director and CEO of Vios Fertility, a Midwest based clinic with 9 offices in the Chicago, Milwaukee and St. Louis regions. At Vios, doctors are committed to helping our patients find their way to fertility health and treatment with the highest chance of success by providing them with innovative, scientific, cutting-edge treatment options along with an unparalleled patient experience. One of the things that brought me to this career was when I was a medical student walking in the halls of Michigan State University clinical campus in Saginaw Michigan. As I was in the hospital, I walked by your door with the words Ivf lab. I thought to myself what a spectacular thing is going on in that room? They are helping people create their families and could there be anything more magnificent? At that moment I decided I would apply for my obstetrics and gynecological Residency and specifically at a place that would give me a good chance of getting the competitive spot in reproductive endocrinology training called a fellowship that would follow. Being involved in this area and space of science and medicine has been an amazing life opportunity. Being a woman as we navigate life’s gifts including the blessings of motherhood, personal challenges have informed my career path. I did get married after I completed my residency. We were blessed with three children that overall delivered without any issues. However, our fourth child delivered early and our daughter Aleena did not survive due to her prematurity. After trying other things, we finally were successful by using in vitro fertilization and transferring the embryo into a gestational carrier. What was funny I would say about this, is that all day I help guide couples to making decisions about their body, their potential future babies as embryos, and one day the tables flipped. It has added a significant element of compassion and empathy to my physician vantage point. It is quite easy for us as care providers to dish it out (I mean this respectfully) but when it turns out to be something we ourselves have to do it reminds us that there is a emotional and scary component to Medicine. I bring this to my patients.…Even though they may not know my story. Listen to their story and pay attention to the details. Listen to their body and what it’s telling you. And finally listen to what they’re not saying and the emotions written in their eyes. This will help guide quite a bit. Sometimes we know what might come so don’t overpromise but don’t undersell. Keeping them in the loop can be very calming for their experience. Smile when you meet them and smile when you see them again. Act like you care about them as a person and with this your care provider/patient relationship can grow strong. #2-Call them by their names. Relationships are personal and by saying their name it makes it feel like you care about them as a person not just a case. If they have children write their names down and ask about them with their names not just “your child or your daughter “ Hearing one’s name is magical. It allows people to know you care. Great books have been written about this but the recipe is simple. Just say their name or their loved ones’ names. Take time to prepare for your job. Educate yourself and your team. Create a team of people that help get your patient to their goal with love, education, and encouragement. You can’t be everywhere, so your team must help you be the best care providers that you can be. Don’t forget that 1+1 = 3 and that synergy is powerful to deliver care. More transparency about personal stories can be very helpful for people to know that you are human being. There is a time and place for this. Allowing the story first to be told by the patient and to let them know you’re listening to them is important. Starting with one’s own story could be perceived as though you were more important than them. Do listen to them first. However when you show them that you also have made similar choices or faced similar dilemmas, It can be powerful for the personal relationship to move forward. So when the moment is right and if you feel comfortable sharing some of your personal stories can be very impactful. I decided to start my own practice in 2015 with amazing people. When we do jump out of our comfort zone there are going to be things in life that challenge us. Don’t be afraid to make these steps even if you make a few mistakes. Brush yourself off and keep charging forward. Education is so powerful. I love teaching and would love to create opportunities for all children to have the opportunity to go to college. An educated child will provide so much more to their family and their community. I wish there was a way to link higher education to high school students in a very impactful way and even those that don’t have the resources.